Back in 1980, aside from a few heavy metal bands, the charts were dominated by effeminate lads with foppish hair and make-up. Visage and Ultravox were riding high with their brands of new romantic electronics, Soft Cell were big news with their Soho synth-pop and seedy lyrics while Adam and the Ants were at the height of their popularity with fun pop songs and dressing-up-box, panto-style theatrics (hard to believe now, but they were very cool at the time). In short, thanks to a new generation of pop stars fixated with David Bowie’s ‘Low’, early Roxy Music and Kraftwerk, pop music had become very androgynous. Step forward, three guys from Long Island, New York. Stray Cats were unlikely heroes. They championed a brand of no-nonsense fifties-style rock ‘n’ roll which was heavily influenced by Eddie Cochran. At a time when that style wasn’t so popular, they represented something altogether tougher and undeniably masculine. They first made waves at the end of 1980 with their first hit single ‘Runaway Boys’. When their self-titled debut LP (co-produced by Brian Setzer and Rockpile’s Dave Edmunds) appeared in record racks in 1981, it was almost totally out of step with the musical climate. ‘Runaway Boys’ opens the album, and it’s here that Stray Cats put most of their cards on the table. Energetic rockabilly rhythms, fantastic upright basses and a simple but thumping drum part ensure the track shows Stray Cats at their best – these key features play a major part in most of the album’s greatest moments. ‘Rock This Town’ is a perfect example of the band’s style – Brian Setzer’s guitar twang evokes the late fifties and is meticulously played, while Lee Rocker’s upright bass drives the track at a jumping pace, while once again Slim Jim Phantom hammers the drum with a musical heartbeat that’s hard to ignore. For ‘Stray Cat Strut’, things slow to a sleazy groove. This provides a closer look into Setzer’s retro guitar style. He really is in a class of his own, as a couple of great guitar breaks prove. Don’t be fooled into thinking it’s just the hits which are the big draw here. The rock ‘n’ roll twang of ‘Rumble In Brighton’ is suitably menacing; the standard rock ‘n’ roll vibe of ‘Fishnet Stockings’ provides upbeat fun and a cover of Warren Smith’s ‘Ubangi Stomp’(a song written in the mid-fifties, which shows absolutely no understanding of other cultures) makes excellent use of the drums, pounding out a basic rhythm. It’s a little heavy-handed in places but works well – provided, that is, you can put up with its potentially racist tone. ‘Storm The Embassy’ is a political song about the 1979-80 Iran hostage crisis. It’s the only time ‘Stray Cats’ obviously deviates from its classic rock ‘n’ roll style. Slim Jim’s drum sound loses its reverb and Lee Rocker’s bass is warmer. In fact, the whole thing sounds like something more modern, even though it retains a little rock ‘n’ roll spirit. Its political lyric also feels a little out of place up against the other, more fun material. A cover of Eddie Cochran’s ‘Jeanie, Jeanie Jeanie’ is tackled at full-pace and has been updated for a demanding post-punk audience by making the lyrics edgier with a liberal use of the f-word, but despite that, it’s a fairly faithful rendition of the song. ‘Crawl Up and Die’ slows things down a little once again and sounds like something based around the ‘Peter Gunn’ theme and is suitably sneering. As you’d expect, ‘Wild Saxaphone’ [sic] is a fast workout featuring brass. With the addition of saxophone to Stray Cats’ trademark rock ‘n’ roll, the end result sounds a little more complex than some of the other material. For a wild saxophone, the brass section isn’t quite punchy enough on this number, coming across as “slightly quirky” as opposed to “wild”, but it’s a minor complaint. ‘Stray Cats’ is a cracking debut album (which interestingly never got a US release, despite the band hailing from New York). It may have a couple of moments which are questionable lyrically, but musically it hits the mark nearly every time. The synth-pop music of the early eighties may come in and out of fashion, but it’s full of dated sounds. 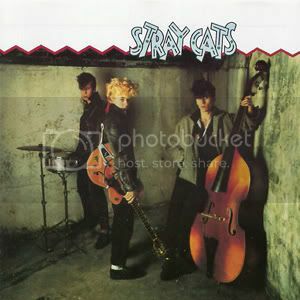 Stray Cats (the band) sounded timeless back then and they sound the same now and ‘Stray Cats’ (the album) is a great snapshot of their talent. The video for ‘Runaway Boys’ here. ‘Stray Cat Strut’ live on US TV here. ‘Runaway Boys’ live on US TV here. Various clips from Japanese TV here. This entry was posted in 80s, rockabilly by Real Gone. Bookmark the permalink.